This here is my home theatre system. It comprises a RX530 Yamaha AV amp with 6.1 DTS, Dolby Digital ES, Pro Logic II and lots of other features. It's sitting below the rest of the Video sources. On top is a satelite decoder from Phillips. Then comes the Toshiba SD-210 DVD Player. 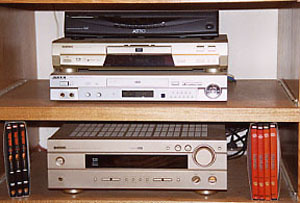 Last is a Japanese VCD player, which was one of few that had S-video output. The decoder also uses S-video, but the DVD uses Component Video cabling. On the right is what the whole package looks like, our living room in the apartment. We also have a 29" Panasonic flat screen television on a rotating table top from Ikea. 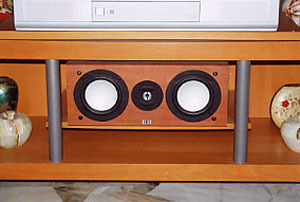 The speakers I use are from Germany called Elac, Series 1. 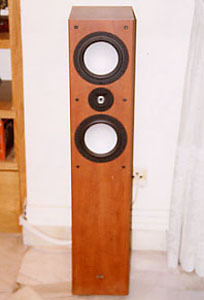 By choosing German over British speakers, I could afford floorstanders instead of bookshelf units. In this way I save not buying a subwoofer, which I thought would be too much since we stayed in an apartment. It took me close to 6 months of auditioning speakers to choose the best ones for my budget. They are bi-wirable 8 ohm with gold terminals that are protected with plastic. 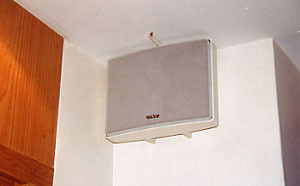 The centre speaker is a matching unit from Elac, placed under the TV but angled slightly upwards. The rear surround speakers are from Infinity. It has 4 4" drivers and is a true surround speaker with a flat profile. I also chose this because of the white & grey colours that could blend into the walls unnoticed. On the right is my DVD collection. Just started it though, but have already got most of the classics, of my generation that is. I have the Gangster collection, Star Wars collection, Jurassic collection, Harrison Ford collection, Kevin Phillips connection and few other movies that I simply had to have due to their story line or visual effects. Lastly, here we have the wires and cables used. 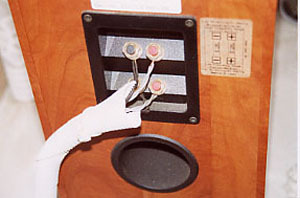 All video signals are fed into the amplifier. 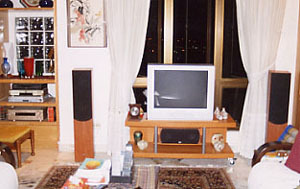 The satelite decoder and Video CD player use a Taiwan made S-video cable. The Toshiba DVD uses American Video Company Component Video cables, due to the length, was actually the most expensive item in the system. And also because it comes in 3, you can see it here, Blue, Red and Green. 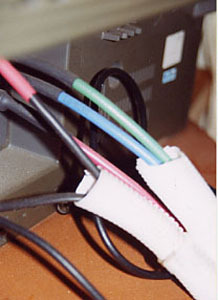 The speaker wires used are 8 wire Kimber Cable. Excellent sound at the right price. Very warm and accurate.